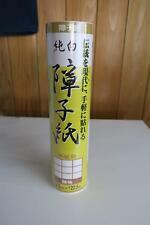 This is Shoji paper. About shoji. Shoji is a sliding screen with white paper on thin. The pattern is Plain. separates the rooms in a Japanese house from. Material is pulp 90% Rayon and Vinylon 10%. 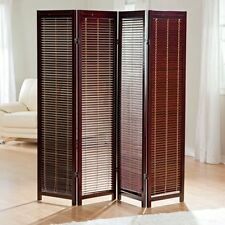 25 cm x 22.5 m.
BRAND NEW - NYC London Paris room divider. 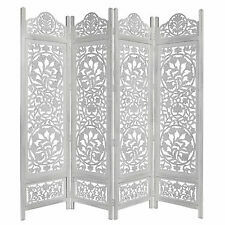 This three panel folding screen can be used as a room divider to enhance the ambiance and add a touch of flair. With its black, solid wood frame and geometric motif, this chic design will be an amazing accent for your home. Folding Screen 3 Panel Silver " Bubble Design "
Folding Screen 3 Panel Gold Frame " Lantern Design "
Folding Screen 3 Panel Cappuccino " Circle Design "
Folding Screen 3 Panel Black Frame" Circle Design "
Our goal is to send zero waste to landfills, of the thousands of textiles & goods that people throw away every year, as much.as 95% could be re-worn or recycled or re-used. 3 panel hinged panels. Total height: 63 3/4" tall - each panel is 16" wide total width of all 3 panels 49" wide. A good looking and well made piece, the pictures look to be copies of original photos, a nice verity, I can see who I think is King George in uniform, a rather beautiful princess complete with tiara and various other family military and special occasion pictures. 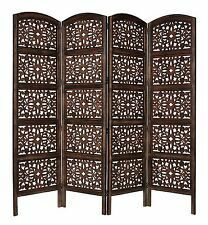 4/8/12Pcs Room Divider Partition Hanging Screen Wall Decals DIY Home Decor 15"
Japanese Wood Carving Folding Screen (Byoubu) 4 panels made from Bamboo bark. It is exudes a sense of unity in the bamboo carving and bamboo bark screen. 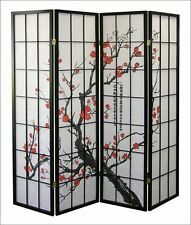 This is a traditional folding screen which combinated wood carving and bamboo bark. Screen - Bamboo bark. 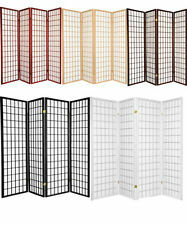 Short size shoji screen, 17.5" by 48" panels, 4 sizes in 4 colors. Color: Rosewood. Beautiful block art print cherry tree design on durable fiber reinforced rice paper shade. Does have a wooden piece broken on one of the end panels. Easily define a space, create privacy and enhance decor. 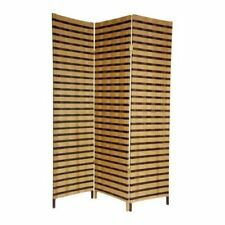 Virgin Islands Beach Room divider is a double-sided design. Crafted of solid wood and canvas to maintain privacy. Double side design. Virgin Islands Beach. Size : 55 in Long. Great as a gift. No assembly required. New in Box. All hardware and parts must be included. Made of solid wood. No assembly required. Made of Wood with Decorative Cutouts. 3 Panel, White Color. 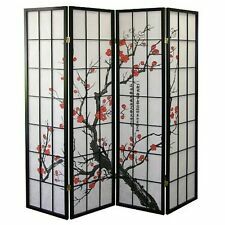 Folding screen with 2-way hinges. All hardware and parts must be included. 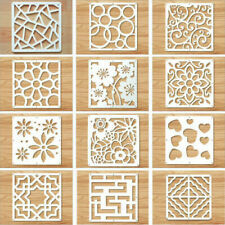 Made of Wood with Decorative Floral Cutouts, See Through. 3 Panel, Walnut Brown Color. Made of solid wood. No assembly required. 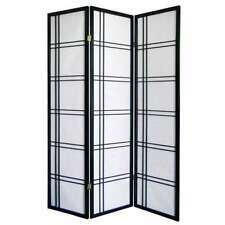 Folding screen with 2-way hinges. All hardware and parts must be included. EZ TWIST SCREEN ROOM 6" X 6"